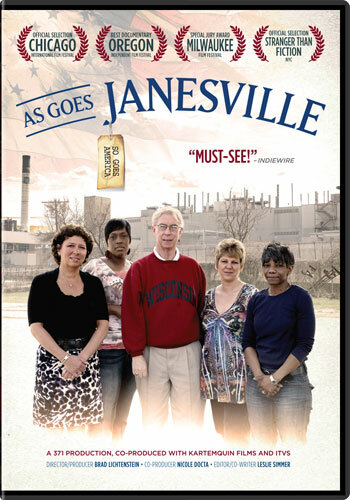 As Goes Janesville reports from ground zero of the recession-ridden heartland — the town of Janesville, Wisconsin. When bankrupt GM shuts down the community’s century-old plant, forcing workers to leave their families in search of decent jobs, local business leaders seize the moment to woo new companies with the promise of lower wages, reduced regulation and tax breaks. Their powerful alliance with newly-elected Republican governor Scott Walker, whose “open for business” manifesto morphs into a “divide and conquer” anti-union strategy that rips apart the state, triggers an historic recall election, and thrusts Wisconsin’s civil war onto front pages nationwide. A cautionary tale for a polarized country falling short of the American Dream, the film follows three years in the lives of laid off workers struggling to survive, business leaders trying to reinvent their local economy, and a state senator caught in the middle, trying to bring peace to his warring state while protecting workers’ rights. As Goes Janesville, so goes America. A co-production of Kartemquin Films, 371 Productions and Independent Television Service (ITVS). We're really trying to get this film out into the world. Please help provide outreach funding.